[0:13] <meshnetn00b> Has anyone here used Processing to display sensor data from the GPIO pins? Or do you have some other scheme you prefer? [0:21] <akk> meshnetn00b: I've read data with python and displayed it in a python gui. [0:21] <akk> I'm not a fan of Processing. [0:37] <puppycodes> Nauti: thank u! [0:39] <meshnetn00b> ShorTie: Processing is a language and IDE built around making art with code. [0:39] <meshnetn00b> akk: Could you point me in a direction to do such a thing myself? [0:41] <puppycodes> this is kinda what i mean, if anyone knows a place i can purchase medical electronic supply? [0:45] <TheG0ldenG0d> I have a 256GB microsd card. Would it work in my pi ? [0:46] <meshnetn00b> which version of pi? [0:48] <meshnetn00b> PI B+ uses a standard SD card, doesn't it? [0:49] <meshnetn00b> It depends on the card technology, not specifically size. But the size is an indicator of the technology. [0:49] <meshnetn00b> Go to the second link I pasted, click on the Size column to sort by size. [0:49] <akk> meshnetn00b: It depends on what you want to do. If it's just collect some data then graph it, look into matplotlib. [0:49] <akk> meshnetn00b: If you want to do graphics that constantly change with the sensor, then you'll probably need to pick a GUI library. [0:50] <akk> meshnetn00b: In python the main GUI options are Tk, GTK and Qt, so you could also look into basic tutorials for those three. [0:50] <meshnetn00b> Nauti: look for a physical lock on the card? [0:51] <meshnetn00b> Maybe toggle it a couple of times to be sure? Test by writing data from another computer? [0:51] <meshnetn00b> akk: display directly from Pi. [0:52] <meshnetn00b> akk: Pi will be receiving the data from ESP units scattered around the school. [0:52] <akk> meshnetn00b: got it. Then yeah, you'll probably need to work with one of those three gui toolkits, though possibly you could do everything with matplotlib. [0:52] <meshnetn00b> Nauti: How did it work on windows or linux? [0:54] <akk> meshnetn00b: At that rate, if you find that matplotlib works for you, you could just draw a new graph every 5 minutes. [0:54] <akk> I'd probably look into that first, unless you want a more complicated GUI. [0:54] <meshnetn00b> akk: I might do that. Seems about like what I had planned with Processing, but I wasn't sure how to interface it with the data. I understand Python has some libraries that may help. [0:55] <meshnetn00b> akk: Well, I was thinking of just displaying a .jpg of the school map, then creating panes over each room in whatever framework I use. [0:55] <meshnetn00b> Nauti: no, to write. [0:56] <akk> meshnetn00b: Ah, then you probably will need one of the gui frameworks, maybe combined with matplotlib. [0:56] <akk> TkInter might be the simplest one to start with, mostly because it doesn't change much (gtk and qt both change all the time so tutorials tend to get out of date). [0:57] <meshnetn00b> Yeah, it's not my bread and butter, so I'd like to find a horse I can ride over and over again. [0:58] <akk> TkInter is the least flexible of the three, but for relatively simple stuff it's probably the easiest to get started with. [0:59] <TheG0ldenG0d> do people still develop GUIs using TK? [1:00] <akk> Small ones, sure. Probably not big complex apps. [1:00] <meshnetn00b> Cause all I need are rectangles that I can change the color of. :P I'll think about adding text later... or first... or at the same time, I don't know. If I can change the color, it seems trivial for the next step to be to actually display the data. [4:34] <Tenacious-Techhu> Anyone know any good XML editors for Raspberry Pi? [4:36] <Tenacious-Techhu> WilliamC, you need to specify which game you want to run correctly; some games have different challenges than others, and sometimes those challenges are insurmountable in Raspberry Pi hardware (or any hardware, for that matter). [4:38] <Tenacious-Techhu> WilliamC, I understood that from your question; but different games have different performance issues, so the particular game matters a great deal as to whether and/or which emulator can solve problems of a specific game. [4:45] <Tenacious-Techhu> WilliamC, you might want to try the #retroarch channel. [6:59] <thomas_25> I've heard many complaints about SD cards dying and all but also rasbian's default fs is ext3 instead of a fs for flash? how come? [7:48] <wallmonitorcable> When I type "shutdown -p now" in FreeBSD on Raspberry Pi, the power isn't turned off. IS this because the RPI is so primitive that it lacks this "fancy" feature? [7:48] <wallmonitorcable> Only when I pull out the physical wire does it shut down for real? [7:53] <Xark> wallmonitorcable: Yep. No way to shut down its powersupply. [8:08] <Xark> wallmonitorcable: If it really bothers you, there are some add-ons that will address this. [8:11] <wallmonitorcable> Xark: Hardware add-ons? [10:13] <wallmonitorcable> Hmm. I see. [10:19] <wallmonitorcable> Well, at least I know it actually works now... but I'm anything but happy with the OS (FreeBSD). [10:19] <wallmonitorcable> I spent 17 years slaving away trying to figure out how to secure and use the OS, which is why I stopped dealing with servers entirely. [10:20] <wallmonitorcable> I tried the new generation 11 (for RPI-B) but they still don't even sync the clock out of the box. [10:20] <wallmonitorcable> I can't deal with all these unknowns and security risks. [10:20] <wallmonitorcable> Goes very much for all Linux distros as well. [10:20] <wallmonitorcable> And all the labor needed to set up and maintain these things. [10:23] <xdb> wallmonitorcable: what's the trouble? [10:25] <wallmonitorcable> xdb: I wish there were some OS I could run on my Raspberry Pi with requires no setup (essentially) and definitely no maintenance. [10:25] <wallmonitorcable> I want it to run itself out of the box and keep itself secure. [10:26] <wallmonitorcable> And I only need PHP (CLI) and PostgreSQL. [10:26] <wallmonitorcable> Which I also want installable in an automated, abstracted manner. [10:27] <xdb> wallmonitorcable: not to be a smartass, but not sure such thing exists in any other area, let alone computers :) it's not hard to install it / keep it safe, if you ask me, though. [10:28] <xdb> wallmonitorcable: but then again, depends on your "security configuration"
[10:29] <wallmonitorcable> xdb: It must be fully secure and not require me to know about 1000000000000 different things that they do by default that is insane. [10:29] <wallmonitorcable> A properly hardened, tight, minimal, *secure* OS. [10:33] <shiftplusone> An OS that doesn't require setup would only be suitable for the person who decided what the default setup should be. [10:35] <wallmonitorcable> Idiotic nonsense replies. [10:36] <shiftplusone> Replying in kind. [10:38] <shiftplusone> Noticed him here yesterday making similar comments. [10:41] <xdb> and everything he asks is: "Give me X, I don't want to do ANYTHING, it has to be THE BEST." [10:42] <xdb> - but, no such thing exist, you have to do at least something? [11:38] <shiftplusone> This probably isn't the place to go for drama. [11:50] <shiftplusone> no worries, I got that... was just curious how many pi DMX controllers there were already. [11:51] <gordonDrogon> I get a lot of email about it - I tell them to bu a USB DMX interface rather than try to make one, or worse, use the on-board serial port. [11:53] <gordonDrogon> I designed simple one for the Apple II many (many!) year ago. [11:55] <gordonDrogon> 16 channels, just on-off - using a 6522. [11:55] <gordonDrogon> would have been about 1980 or 81. [11:55] <gordonDrogon> ah well, fun day. [11:56] <mfa298> oddly enough one of the things on my project list is doing some PWM stuff with RGB leds, and the add on to that was to interface via DMX - but then I've already got bits of DMX stuff to interface with. [11:57] <Lisa_Fox> The closest I've come to is just a control program for the X10 Home automation system, again on the Apple II with a serial X10 interface on it. I want to do something similar on the Pi eventually. [11:58] <gordonDrogon> mfa298, the pimoroni blinkt led strips are fun to play with. [11:59] <gordonDrogon> is it? I thought it was relatively new radio stuff.. Hmm..
[12:00] <Lisa_Fox> Yes, X-10 keeps making stuff that runs on the same powerline protocol since then. the wireless version is a little newer though. [12:04] <Lisa_Fox> Pico Electronics developed the X-10 protocol. [12:05] <Lisa_Fox> It's a simple thing to hack with, but there are better home automation systems now that will send ACK responses at least. [12:05] <Lisa_Fox> It's a pain to write for a system when the modules don't comfirm if they received the command. [12:06] <shiftplusone> Is that '75 as in 1875? [12:07] <shiftplusone> I'll get my coat. [12:08] <Lisa_Fox> gordonDrogon, awesome! Which version of the 8 do you have? [12:09] <gordonDrogon> I have an 8/a with 16KW and a couple of PiDP8's which don't really count. [12:10] <Lisa_Fox> I had most of an 11/70 but I gave it to another collector because I didn't have the room. [12:11] <gordonDrogon> the chap who did the PiDP8 is doing an 11/70 panel - Pi Zero inside like the PiDP8. [12:12] <Lisa_Fox> whoo! That's aweome! [12:12] <gordonDrogon> the 11/44 doesn't really have much in the way of blinkenlights though. I think the 11/70 was about the last switch & LED model. [12:13] <Lisa_Fox> the 11/23 is devoid of blinkenlights as well. [12:13] <gordonDrogon> My 8/a has the keypad and 4-digit display. [12:14] <Lisa_Fox> The 8/A looks a lot like an 11/34 panelwise. [12:15] <Lisa_Fox> that looks great! [12:16] <gordonDrogon> I currently have the panel off it and the IO board out so I can connect in some ribbon cable for the serial port. 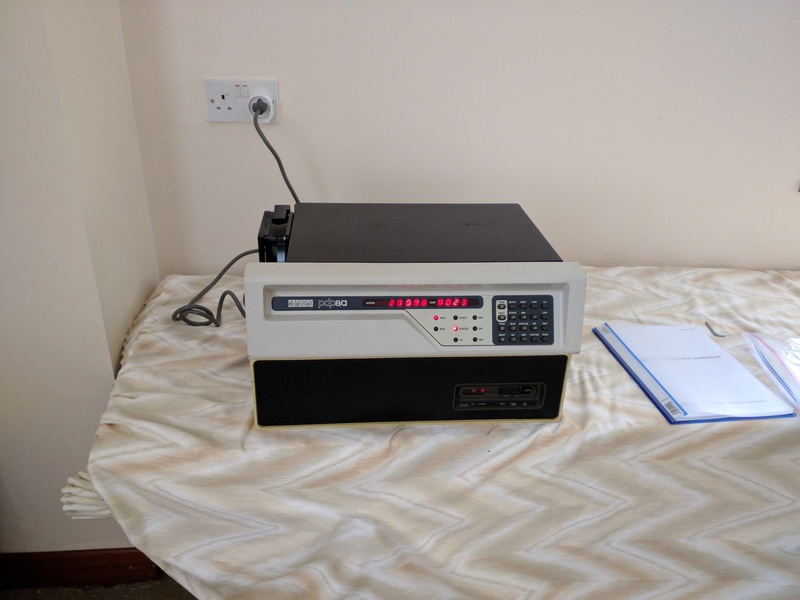 [12:17] <gordonDrogon> I'm told by the chap I bought it from that there's another one still in-use 24/7 - the 8/a's were frequently used as industrial controllers for CNC machines. [12:19] <gordonDrogon> it's pretty close. it's smaller though - no scale to that photo (sorry). Oscar even managed to get the right colours for the switches. [12:20] <gordonDrogon> the shell is injection moulded. [12:20] <Lisa_Fox> I'd love to own one of these! [12:20] <gordonDrogon> he'll be selling them in a few months time. [12:21] <Lisa_Fox> very neat! I will start saving up for one i think. [12:21] <Lisa_Fox> Thank you for sharing it! 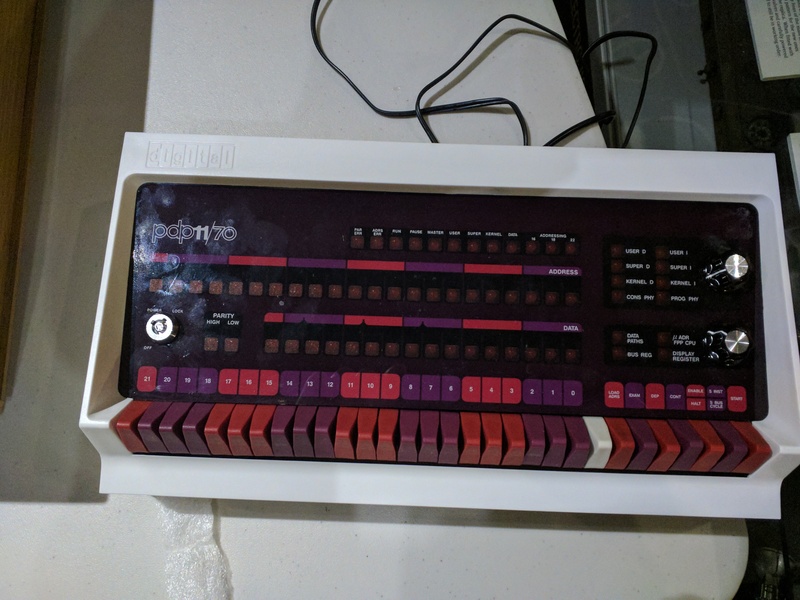 [12:22] <gordonDrogon> that's a video of my PiDP8 on-top of a real PDP-8 - the 11/7 is the same size, so you can get an idea of scale from that. [12:23] <Lisa_Fox> I have seen the PiDP8 before. yeah i can see the difference in scale. [12:23] <gordonDrogon> This: http://obsolescence.wixsite.com/obsolescence is Oscars site - keep an eye on it for the 11/70 panel. [12:56] <Lisa_Fox> BBL - need to move the computer - I'm doing Winter cleaning in my Workshop Lab. [13:09] <gordonDrogon> why is it interesting? It's a few years old by the looks of it ..
[13:12] <gordonDrogon> looks like someone setup a mirror some time ago. [13:18] <Nauti> any high-end products. Just functional and more reliable than micro-SD is perfectly fine with me. Anyone know anything about power efficient SSD:s? [13:19] <gordonDrogon> what are you doing that wears out SD cards? [13:22] <clemens3> just one moment ago, I put a sd card via usb adapter into an external usb adapter with power, which also supports the linux disk with the root system. I just touched it, and then udev lost contact to the disk..
[13:23] <Lartza> Nauti, Crappy SD cards? No warranty? [13:24] <clemens3> is there a way to attach a sata disk instead? [13:24] <clemens3> maybe i should try with ssd via usb..
[13:25] <clemens3> hmm, i want to make the raspberry my main desktop, but so far after a few days, something like this happens regularly..
[13:33] <clemens3> Nauti: yes, I think I have to seriously look at them.. just maybe they are less stable in other areas than the pi..
[13:34] <Nauti> And the write/read speed of SATA and USB2.0 isn't really comparable? [13:34] <Lartza> If they have "SATA"
[13:37] <Lartza> What country are you in? [13:38] <clemens3> Nauti: yeah, thanks.. I guess most people just have something else as their main machine and don't mind rebooting every other week or so..
[13:40] <clemens3> Lartza: my macbook is now up for 122 days..
[13:42] <gordonDrogon> I have not had any special issues running Pi's for over a year without rebooting. [13:43] <gordonDrogon> MrCrackPotBuilde, maybe an 'application server' (whatever that is), is not a Pi specific thing - generic Linux? broaden the search? [13:43] <gordonDrogon> why 'haha' ? [13:43] <gordonDrogon> the Pi has 2 hardware PWM pins. [13:44] <clemens3> gordonDrogon: you use it as a desktop or some dedicated server/purpose and from sdcard for that? [13:44] <gordonDrogon> so.. go study QT .. it's just a set of c++ libriares..
[13:45] <gordonDrogon> MrCrackPotBuilde, server/client, client/server - it's just some tcp sockets - pick your library and go for it. plenty of examples online for simple stuff liek that. [13:50] <gordonDrogon> My Mile fridge/freezer failed recently - it was < 4 years old and was covered by the (former) UK Sale of Goods act, but the shop refused to do anything - the advice I got was to sue the shop. [13:51] <gordonDrogon> google for tales of woe converning pc world, currys, etc. [13:51] <Nauti> Lartza: where did you find that information? [14:17] <shiftplusone> gordonDrogon: You actually need to sue them for anything to happen? In Australia, you can contact the government watchdog which monitors that kind of thing and they are sometimes actually useful. [14:20] <gordonDrogon> shiftplusone, more or less, yes. they refused to do anything - all I could do would be to call the police and tell them they were breaking the law - the police would then tell me "it's a civil matter, sir" and leave me to it. [14:21] <gordonDrogon> there are documented cases where the shop has called the police to try to get rid of the customer too. [14:21] <redrabbit> still running but it's not reachable from the outside > psu issues? [14:22] <shiftplusone> "Get help from Citizens Advice about your consumer rights. They can also refer your complaint to local Trading Standards officers who may then investigate on your behalf." [14:23] <gordonDrogon> shiftplusone, "may investigate". [14:24] <gordonDrogon> shiftplusone, it's worth a shot .... if you have the energy to do it and keep on-top of it. these sorts of things can take months to resolve. I wanted my fridge to work. [14:25] <gordonDrogon> just google for examples of shops ignoring the sale of goods act. you'll find 1000's of cases, sadly. [14:25] <gordonDrogon> b&q, pc world/currys seem good examples. [14:25] <gordonDrogon> in my case it was a local shop we'd bought stuff from in the past, but now they'll not get another penny from me. [20:02] <ShorTie> shiftplusone, who messed up the latest lite image ? ?